66. Unusual Light Source - Take a picture with an unusual light source today, such as a flashlight, computer monitor, or whatever else strikes your fancy! It's a subject that had crossed my mind while reading my new book on lighting (Light Science and Magic by Fil Hunter, Paul Fugua, and Steven Biver) and it had seemed like a good idea at the time. It wasn't until I saw it come up as the topic that I realized I probably already used most of the unusual light sources at my disposal in the past - things like Colman lanterns, candles, head lamps, flashlights, and Christmas lights. So as I stood in the kitchen, chanting "light... light... light..." I was more than a little relieved to notice the fridge sitting there. Whew! This was practically a done deal. 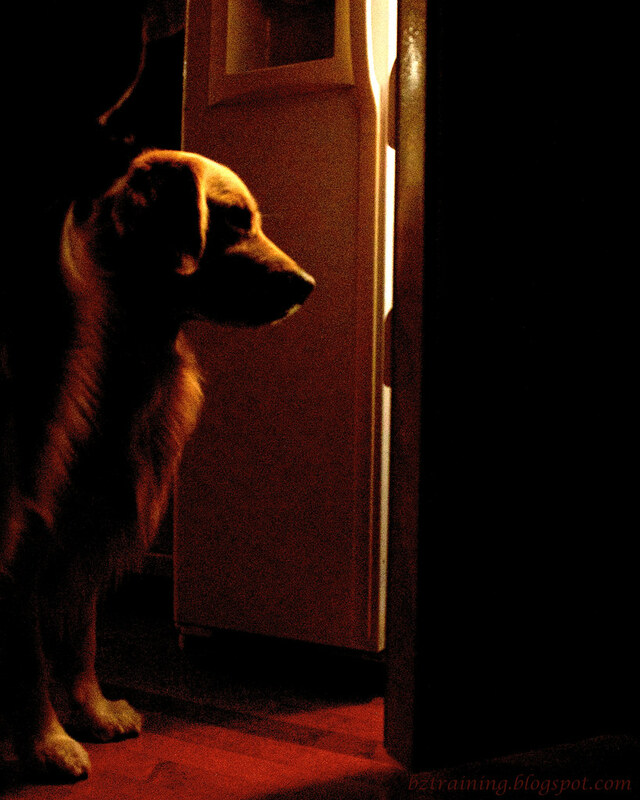 Camera on tripod, turn out the lights, open the fridge door, get the dogs to look inside - easy! Well... mostly silly. I did get an opportunity to try out my new remote control for the camera (WONDERFUL thing! Highly recommend getting one if such a thing exists for your camera!!!) as well as the "how low will it go" feature on my new, heavy-duty tripod (answer? really low) - but getting the boys to look inside the fridge was a disaster. In retrospect, I think the remote control for the camera was screwing it up, since I was pointing into the fridge with one hand while pointing back to the camera with the other, and the boys couldn't make up their mind which hand they should be following. Even a bowl of cookies placed inside the fridge didn't really help the problem that much. Our Daily Challenge - Jan 5, 2012 - "Come On In"
112 Pictures in 2012 - "#41. Door(way)"
... so all was not lost. About that time, hubby shows up with the small blue light bulb and pops it into one of the floor lamps. Whew! What a relief. This was practically a done deal. 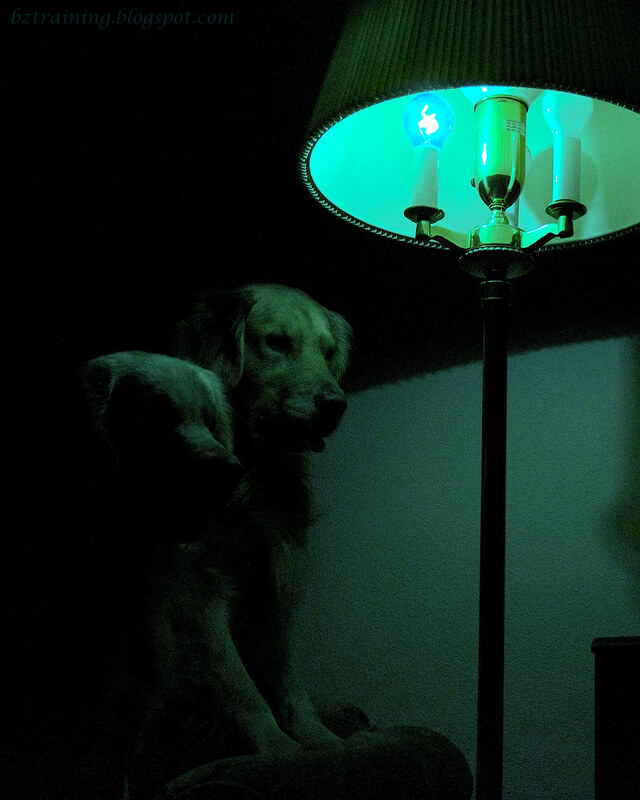 Camera on tripod, turn off all lights but the blue bulb, get the dogs on the sofa near the light, get the dogs to look at the bulb (it's just a little 25 Watt light) - easy! For one thing, the dogs looked like the Keystone Cops as they tried to decide who was going to stand where on the relatively narrow area of the sofa. And they got too close to the light (too much in shadow) or too far (too much in shadow) or looked at the hand holding the remote control for the camera (again). All was not lost! They are great pictures! Man, dogs can prove difficult to work with when taking pictures... they are good for a few seconds, then in the nanosecond you push the button to take the picture, they seem to do something odd like make a face or wander off... all in all, I'd say these pictures turned out great and you definitely captured your "unusual light source" and dog together perfectly! You're definitely on top of these challenges! I bought a remote for my camera and it is quite handy. Your talking about this reminded me I should use it more....hello..get it out and try it...yes, I will. I swear I'm not laughint! Much... I think the pictures both turned out pretty cool. I hate when you think you have a brilliant idea and then it just won't work. I suppose you don't want to see the colored light source assignment come up anytime soon now, then? The fridge idea was great, I hope you revisit it.